bareMinerals will be touring the country this September in their rather cute skincare van! 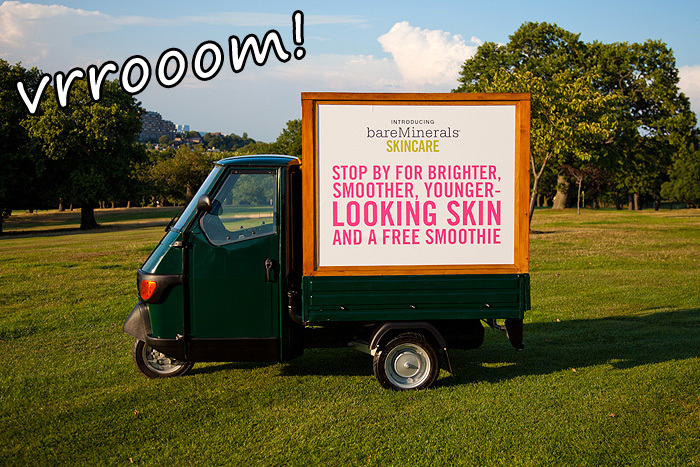 Celebrating the nationwide launch of bareMinerals skincare, the brand are inviting you to look out for the van and stop by for a closer look at the products and enjoy to a free RDA Organic Smoothie on them! I know I shouldn’t, but I can’t help but have a giggle at the tour van. It’s not exactly glamourous is it? Beep Beep! Not the most extensive UK tour I’ve ever seen (sorry Northerners, Welsh and Scots), but if you happen to be nearby, it’s worth a look. I’m a big fan of the bareMinerals Purifying Facial Cleanser which has replaced Cetaphil as my morning cleanser of choice. They should have named the van, that van needs a name. I vote for Barney. Awwww :3 It’s a little van edition of a reliant robin. Also if you pay closer attention to the front of the van it looks like a bird wearing sunglasses, beak n all… so many bird references. I vote we name it The Pecker or Timbleton.